Nestled amidst the Arbuckle Mountains, the spectacular Turner Falls is Oklahoma's tallest waterfall. A captivating view of the Turner Falls waterfall. Falling 77 feet from the top of the Arbuckle Mountains is the Turner Falls Waterfall, the tallest waterfall in Oklahoma, a state in the US. These Falls are hidden within the Turner Falls Park which is tucked away in these tree-covered mountains in the south-central region of the state. The nearest town is Davis which lies 6 miles to the north and has a population of just 2,683. Honey Creek provides the source for this beautiful cascade. 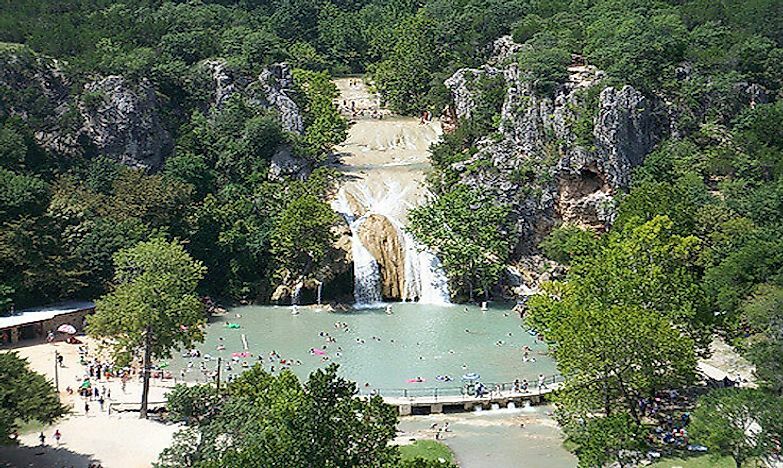 Recorded history of the Turner Falls waterfall dates back to 1878. A Scottish immigrant farmer living in the area, Mazeppa Thomas Turner, stumbled across the Falls while out one day. He went on to become a state politician, and the discovery was named after him. The city of Davis purchased the area in 1919. From 1919 until 1950, Davis administered the area as a public park. In 1950, it leased the park to a private entity until 1978. Since then, the Turner Falls Park has been open to the public for tourism purposes. 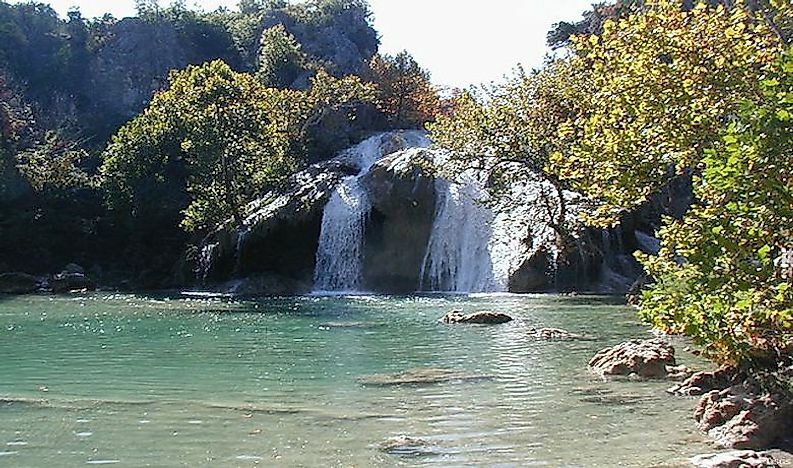 The ecoregion surrounding Turner Falls waterfall is known as the Cross Timbers. Characterized by prairie, savanna, and woodlands, Cross Timbers is the zone between the Great Plains and the thick forests of the western part of the state. The Arbuckle Mountains within this region are filled with caves, sinkholes, and several types of waterways. Biodiversity within this region has been significantly diminished in modern times but was once unique and plentiful. Today, the mountain lions and black bears have been replaced by coyotes, white-tailed deer, bobcats, fox, and wild turkeys. The range is on a migratory bird path and offers shelter to birds heading south for the winter. Many of these birds, including waterfowl and birds of prey, use the area for breeding. The woodlands are filled with a mix of tree species including black hickory, easter red cedar, ash, and black oak. Swimming in the natural pool created by the falling waters of Turner Falls waterfall is a popular tourist activity at the park. Hiking to one of three interesting cave formations in the Turner Falls Park is another favored tourist activity. A unique attraction is the rock castle built in 1930. Park administrators are proud of the fact that the castle was constructed of native materials and based on Old English architecture. It was previously a summer home for one of Oklahoma University’s professors. Camping and picnic sites are also available. The Cross Timbers ecoregion surrounding the Turner Falls Waterfall is considered one of the least conserved areas. Aside from 2 parks (including Turner Falls Waterfall) in Oklahoma, not much of the land has been made public. The private land in the area has also not been regulated by wildlife management. This puts the ecology at risk of fragmentation which separates important habitats and decreases native species’ habitats. The remaining forests here are some of the least disturbed in the area and offer a unique look into their ecosystems. Aside from not being protected by public management, this area is also known to be rich in oil and natural gas. Exploration efforts could become a threat in the future. Continued development of this ecosystem could threaten already endangered species like the black-capped vireo and golden-cheeked warbler birds. Conservation efforts should focus on the forest lands and the rivers that run through the region as they offer shelter to a wide range of plants and animals. These efforts must include educating private landowners about the biodiversity and fragility of the region, protecting the area from resource extraction, and investing in research efforts to understand the area’s biodiversity. Which States In The United States Are Part Of The Dixie Alley?